There are currently 308 Commercial properties for Sale & Lease in Melbourne, VIC. We have 19 Commercial properties for sale and 301 Commercial properties for lease in melbourne .With 308 Offices, 8 Other Commercial Properties, 2 Industrial Warehouses , 1 Hotels and Leisure and 1 Retail Shops for Sale & Lease. Contemporary Office Space | Premium Grade Office Space | Enviable Location $690pw | 6 Person Workspa..
PROPERTY OVERVIEW $690pw Price incl. We’re in office heaven at 171 Collins Street. Stunningly illuminated and beautifully spacious with a collaborative community vibe, it blends professionalism with casual comfort to create a serviced office that delivers on every promise. Choose this stylish office for the latest tech, high class facilities, admin support and the incomparable feel of a close knit community achieving their business goals. This building is Melbourne’s first Premium Grade, 6 star Green Star office building. Located at the prestigious “Paris end” of Collins Street, it presents a new benchmark for business with a beautifully detailed facade, spectacular nine story atrium and elegant architectural statements worthy of this premium address. Melbourne’s fabulous array of cafes, restaurants, shops and fitness centres are within arm’s reach and the commute is easy with trams, trains and buses close by. The advertised office space is perfect for a team of 6. If you need more or less space, we have over 30,000 furnished workspaces all over the world suitable for a team of 1 to 200+. Our award winning team offer a free service that will help you find the perfect solution for your needs, so reach out if you need more help. What you get for your weekly rent_ Furnished with desks, chairs and storage Commercial grade internet Electricity included Building outgoings included Regular cleaning Access to shared meeting rooms Access to shared kitchen facilities Flexible terms 24/7 access Office and building features Air conditioning Administration support available Business lounge Lift Access Conference facilities available Postal facilities available Bike racks Disabled facilities Shower facilities Car parking on site Dedicated mens and ladies bathrooms 400m from Flinders Street Station 250 from Federation Square/Yarra River bike paths 20m from Collins street bus stop Close to cafes, restaurants, bars and speciality retail WHO IS OFFICE HUB? Office Hub is Australia & New Zealand\'s No 1 small office space commercial real estate agency. We have the largest collection of shared spaces, coworking and serviced offices in Australia & New Zealand, perfect for 1 100 employees. Let us take you on a tour of all the spaces that fit your needs and budget. Our service is complimentary and we work for you and the landlord to negotiate the most competitive deal in the market. Let us show you how shared and serviced offices can be the perfect solution for your business. www.office hub.com.au www.office hub.co.nz Conditions apply A portion of the square meterage factors in access to shared space. Price includes any incentives offered. This is for new tenants only. $725pw | 4 Person Workspa..
PROPERTY OVERVIEW $725pw Price incl. Traditional serviced office in Premium Grade building on Collins Street. This light filled space is the perfect environment for any small business to operate from with quality modern features and contemporary communal breakout areas with stunning city and bay views. Newly completed, it provides the ideal setting to showcase your business and fire up your success. Price is inclusive of everything to do with the space and mail management, meeting rooms, foyer signage and server storage is available. This is one of Melbourne’s most iconic addresses with a Premium grading and stunning modern facade. It is central to the city’s three main districts, CBD, Docklands and Southbank, and immersed in the legal, commercial, insurance, banking and finance precincts. Convenience is unparalleled with a commercial lobby and cafe, ground floor retail and Virgin Active Health Club on the premises. Southern Cross Station is just 100m away. The advertised office space is perfect for a team of 4. If you need more or less space, we have over 30,000 furnished workspaces all over the world suitable for a team of 1 to 200+. Our award winning team offer a free service that will help you find the perfect solution for your needs, so reach out if you need more help. What you get for your weekly rent Furnished office with desks, chairs and lock up storage units Complimentary receptionist to meet and greet your clients Unlimited commercial grade internet service Electricity usage included Regular cleaning Telephone number & handset Prestigious business address to put on your cards Flexible terms from 1 month 2 years Ability to bring your existing phone number over 24 x 7 access to your office 24 x 7 security Building features Premium grade building Bike racks & shower facilities in the building High speed lifts Car parking in building and surrounding areas Dedicated on site management team Office features Stunning city and bay views from selected offices Air conditioning in all offices Full mail management and postage Meeting and boardrooms available Signage board in foyer to highlight your business name Quality finishes and amenities throughout Server / Comms rooms available for server storage 10m to Collins Street bus stops 25m to Collins Street trams 100m to Southern Cross Station Close to restaurants, cafes, pubs, shops in fact everything! WHO IS OFFICE HUB? Office Hub is Australia & New Zealand\'s No 1 small office space commercial real estate agency. We have the largest collection of shared spaces, coworking and serviced offices in Australia & New Zealand, perfect for 1 100 employees. Let us take you on a tour of all the spaces that fit your needs and budget. Our service is complimentary and we work for you and the landlord to negotiate the most competitive deal in the market. Let us show you how shared and serviced offices can be the perfect solution for your business. www.office hub.com.au www.office hub.co.nz Conditions apply A portion of the square meterage factors in access to shared space. Price includes any incentives offered. This is for new tenants only. Cool Space | Modern Building | Creative Space $3717pw | 22 Person Works..
PROPERTY OVERVIEW $3717pw Price incl. Situated in Melbourne’s entertainment precinct, this coworking centre in the East End is the ideal home to grow your business. With three floors of sleek private offices, bright and airy lounges and beautifully designed meeting rooms, it creates a unique and collaborative work experience for every member. This workspace rental provides desk furniture, printers, high speed internet and soundproof phone booths as well as the flexibility to upsize and alter your space as you grow. Reenergize with free micro roasted coffee and fruit water, catch up with a colleague in the comfy lounge and perfect your pitch in the AV equipped meeting rooms. And become part of a greater ‘we’ with workshops, thought leader panels and cheese tasting, whether you’re boosting your team’s culture or connecting with other self starters. Short and long term rent available from 1 month to 2+ years – book a tour through Office Hub for the best rates at this premier Melbourne CBD coworking space. 222 Exhibition Street is an A Grade office tower situated in one of Melbourne’s liveliest locations in the East End theatre and entertainment district. Rising 29 levels tall with parking, retail and office spaces, it boasts stunning protected views across the city and a vibrant location surrounded by restaurants and bars. This luxurious coworking centre spans three floors of the glass walled building and features a sprawling seventh floor balcony where you can watch the city hum beneath you. The already impressive construction was refurbished in 2017 to cement its place among Melbourne’s landmark office towers, with focus on sustainable features and wellness among tenants. It boasts a 4.5 Star NABERS Energy Rating, modern end of trip facilities and proximity to the city’s parks, gardens, bicycle paths and gymnasiums as well as proximity to nightlife, laneways and retail offerings. 222 Exhibition Street provides an elegant arrival experience with a lobby cafe and expanded retail offering as well as a stunning tessellated facade for a powerful street presence. The advertised office space is perfect for a team of 22. If you need more or less space, we have over 30,000 furnished workspaces all over the world suitable for a team of 1 to 200+. Our award winning team offer a free service that will help you find the perfect solution for your needs, so reach out if you need more help. What you get for your weekly rent , 24/7 Access , Access to complimentary bar , Building outgoings included , Collaborative space with a great community feel , Electricity usage included , Flexible lease terms from 1 month , FREE business networking events , Fully equipped boardrooms, meeting rooms and day offices (fees may apply) , Plug and play furnished workspace , Regular cleaning , Secure high speed Internet Building features , Abundance of natural light , Air conditioning , Complimentary business Lounge , Concierge on ground floor , Conference facilities available , Creative co working space , Impressive A grade foyer and fit out , Rooftop Bar and break out space , End of Trip facilities , Impressive new fit out 300m to Parliament Railway Station 400m to Bourke Street trams 500m to Carlton Gardens Next door to Comedy Theatre 270m to Chinatown Who is Office Hub? Office Hub is the world\'s No.1 marketplace for office space. We have a huge global selection of coworking spaces, serviced offices and shared office spaces with flexible options to suit teams from 1 200 people. We\'ll take you on a tour of all the workspaces that fit your needs and work on your behalf to get the best price possible. We\'ll help you discover how shared office space can be the most beneficial and budget friendly solution for your business. www.office hub.com Conditions apply – the advertised price includes any incentives offered based on a 12 month agreement and is available to new tenants only. Please note that the rental rate may increase for a shorter rental period. A portion of the square meterage factors in access to shared space. Innovative Working Environment | Creative Space | Premium Grade Office Space $4315pw | 15 Person Works..
PROPERTY OVERVIEW $4315pw Price incl. Beautiful workspaces for rent on Collins Street within a global network of luxury coworking spaces. For creatives, professionals and businesses seeking something a little different, here is a stunningly special workspace solution in Melbourne CBD. You’ll find spaces to match your mood, services to ease your journey and conversations to spark creativity. Split across two levels of the iconic Royal Bank Chambers, the coworking hub offers both open and private spaces that are clearly curated to provide high energy or ambient peace. The diverse facilities at this office space include indoor and outdoor function areas for up to 100 guests and you can take your pick from seven readily available meeting rooms, each designed for a specific purpose such as training days, board functions and idea generation. The concierge is on hand to help your day flow, whether you need a killer caffeine hit or someone to set up the video conferencing, and the community is carefully curated to bring together a diverse network of ambitious pros. This premier coworking space perfectly captures a refined European aesthetic and gives members access to partner workspaces in global capital cities – come and thrive in an exciting ecosystem of innovators, creators and go getters. Flexi memberships for 1 100 people starting from 1 month available now. This luxurious coworking space is set in the heart of the highly regarded Collins Street in the Royal Bank Chambers building, a true architectural icon in the heart of Melbourne CBD. Located at 287 Collins Street, it was built for ES&A Bank in 1941 and features stunning Art Deco finishes such as a white marble clad foyer and grand staircase along with modern end of trip facilities, retail and disabled facilities. The building is located in the middle of Collins Street to provide employees with unparalleled access to Melbourne’s vibrant laneways, high end retail and fantastic dining scene while decision makers will love the close access to CBD based clients. The advertised office space is perfect for a team of 15. If you need more or less space, we have over 30,000 furnished workspaces all over the world suitable for a team of 1 to 200+. Our award winning team offer a free service that will help you find the perfect solution for your needs, so reach out if you need more help. What you get for your weekly rent , 24/7 Access , Access to internal breakout areas , Access to kitchen facilities , Access to secure printer and scanner , Building outgoings included , Electricity usage included , Flexible terms , One simple bill for everything related to your workspace , Regular cleaning , Secure high speed Internet Building features , Abundance of natural light , Air conditioning , Bicycle storage , Car parking Street / Public Car Park (Paid) , Disabled access and facilities , End of trip facilities e.g showers, bike racks , Onsite Cafe / Restaurant , Taxi / Uber stand close to building 81m to Elizabeth Street Tram Stop 5 350m to Flinders Street Railway Station 270m to Bourke Street Mall 35m to Block Arcade 750m to Yarra River Who is Office Hub? Office Hub is the world\'s No.1 marketplace for office space. We have a huge global selection of coworking spaces, serviced offices and shared office spaces with flexible options to suit teams from 1 200 people. We\'ll take you on a tour of all the workspaces that fit your needs and work on your behalf to get the best price possible. We\'ll help you discover how shared office space can be the most beneficial and budget friendly solution for your business. www.office hub.com Conditions apply – the advertised price includes any incentives offered based on a 12 month agreement and is available to new tenants only. Please note that the rental rate may increase for a shorter rental period. A portion of the square meterage factors in access to shared space. Creative Space | Trendy Location | Great Amenities $10414pw | 70 Person Work..
PROPERTY OVERVIEW $10414pw Price incl. OPENING 1 APRIL 2019! Vibrant coworking spaces in Docklands with art filled interiors, comfy lounges and networking events to help the creative community grow and thrive. Occupying six floors of this 22 storey tower, this coworking hub provides the space, community and convenience your team needs. Collaborate in a cosy corner, create in your private office and connect with like minds at the next event – this workspace is devised to hone businesses and their people. Onsite staff support you throughout the work week, free refreshments keep you energised and professional meeting rooms offer an environment for every appointment. Simple monthly billing takes the hassle of office space away, and inclusive internet and ready to use furniture make this workspace move in ready. Close to shops, restaurants and Marvel Stadium, you’ll find plenty of reason to step away from your desk and explore the exciting Docklands precinct. Enquire or schedule a visit today to explore options for individuals, small groups and teams with up to 100 people in this invigorating serviced office in Melbourne. Photos are example photos. 120 Spencer Street is positioned on the doorstep of Southern Cross Station for unparalleled accessibility in Melbourne’s emerging commercial district of Docklands. The 22 storey B Grade building boasts uninterrupted panoramic views, new destination controlled lifts, secure bike storage and modern shower and changing facilities to provide ultimate comfort for your team. Commuting is a breeze with easy proximity to trams, trains and buses, while after work fun awaits in the energetic Docklands precinct where great waterfront restaurants, energetic bars and entertainment venues converge. This Docklands office space puts you in the heart of the action surrounded by global leaders and emerging businesses in every field – join the hype and book a tour at this world leading coworking hub today. The advertised office space is perfect for a team of 70. If you need more or less space, we have over 30,000 furnished workspaces all over the world suitable for a team of 1 to 200+. Our award winning team offer a free service that will help you find the perfect solution for your needs, so reach out if you need more help. What you get for your weekly rent , 24/7 Access , Access to kitchen facilities , Building outgoings included , Collaborative space with a great community feel , Electricity usage included , Flexible lease with the ability to grow into bigger space , Fully equipped boardrooms, meeting rooms and day offices (fees may apply) , One simple bill for everything related to your workspace , Regular cleaning , Secure high speed Internet Building features , Abundance of natural light , Air conditioning , Bicycle storage , Creative co working space , Retail and shopping malls nearby , Professional environment , Bike racks , Impressive new fit out , Showers 53m to Southern Cross Train Station 140m to Collins Street trams (11, 12, 48, 109) 240m to Fitness First & Virgin Active 1km to Docklands' waterfront bars and restaurants 550m to Marvel Stadium Who is Office Hub? Office Hub is the world\'s No.1 marketplace for office space. We have a huge global selection of coworking spaces, serviced offices and shared office spaces with flexible options to suit teams from 1 200 people. We\'ll take you on a tour of all the workspaces that fit your needs and work on your behalf to get the best price possible. We\'ll help you discover how shared office space can be the most beneficial and budget friendly solution for your business. www.office hub.com Conditions apply – the advertised price includes any incentives offered based on a 12 month agreement and is available to new tenants only. Please note that the rental rate may increase for a shorter rental period. A portion of the square meterage factors in access to shared space. Premium Furnishings | Modern High Rise Building | Great Location $2503pw | 20 Person Works..
PROPERTY OVERVIEW $2503pw Price incl. Fantastic serviced office 5 mins walk from Southern Cross Station. Price incl. Internet, Telephone, Kitchen & Electricity Flexi terms Regular Cleaning 24/7 access Modern Furnished Offices A Grade Building Dedicated receptionist Avail NOW for short or long term rent Positioned in the heart of the Melbourne CBD's legal and commercial district, 570 Bourke Street boasts a prime location as Melbourne CBD's largest vertically connected workspace. This building creates a distinct corporate presence in the heart of the flourishing CBD. The glass atrium within the building creates the largest vertically integrated floor plates available in Melbourne CBD. The centre offers a range of fully furnished offices for 1 20 people, featuring natural light and views in this highly sought after business address. Enjoy the space and flexibility of expanding into the CBD while benefiting from the buildings amenity. The advertised office space is perfect for a team of 20. If you need more or less space, we have over 30,000 furnished workspaces all over the world suitable for a team of 1 to 200+. Our award winning team offer a free service that will help you find the perfect solution for your needs, so reach out if you need more help. What you get for your weekly rent Furnished office with desks, chairs and lock up storage units Commercial grade internet service Telephone number & Handset with ability to bring your existing phone number over Complimentary receptionist to meet and greet your clients Dedicated telephone answering Administrative and IT Support Complimentary electricity usage Regular cleaning of your office Access to fully equipped meeting rooms and boardroom Unlimited use of the kitchen facilities Prestigious business address to put on your cards Flexible terms from 1 month 2 years 24 x 7 access to your office 24 x 7 security Office features Air conditioning in all offices Brand new offices Quality & modern furniture Building Features 'A grade redeveloped building Car parking in building and surrounding areas Dedicated on site management team State of the art gymnasium and end of trip facilities New laneway with retail and caf_ with on site amenity 4.5 star NABERS energy rating 50m to Bourke Street Trams 50m to Gym, Pub and Shopping Centre 500m to Southern Cross Station 300m to Supreme Court of Victoria WHO IS OFFICE HUB? Office Hub is Australia & New Zealand\'s No 1 small office space commercial real estate agency. We have the largest collection of shared spaces, coworking and serviced offices in Australia & New Zealand, perfect for 1 100 employees. Let us take you on a tour of all the spaces that fit your needs and budget. Our service is complimentary and we work for you and the landlord to negotiate the most competitive deal in the market. Let us show you how shared and serviced offices can be the perfect solution for your business. www.office hub.com.au www.office hub.co.nz Conditions apply A portion of the square meterage factors in access to shared space. Price includes any incentives offered. This is for new tenants only. Creative Co-working Hub | Quality Furnishings | Collaborative Space $704pw | 8 Person Workspa..
PROPERTY OVERVIEW $704pw Price incl. Sophisticated and creative coworking space in Melbourne CBD in a beautifully restored 19th century building. This elegant coworking hub offers fellow creatives a classy and convenient workspace that better reflects their singularity, flair and passion. Spread over two levels, it has dedicated desks and private studio offices in a range of sizes, along with carefully curated shared facilities including a 10 seater boardroom, 6 seater meeting room, 2 informal breakout areas, printers and 2 fully equipped pantries. Style savvy and eco conscious members will appreciate the high end locally made fixtures and fittings such as lights by Laal, bespoke leather handles by Made Measure, Sayl chairs by Herman Miller, Gubi boardroom chairs and custom plywood furniture by Power to Make – all carefully selected to maximise comfort and deliver a luxurious aesthetic that will stun clients and colleagues. Memberships are all inclusive of 24/7 access, high speed fibre internet, refreshments and snacks, and they grant great flexibility – book for 1 month, stay for a particular project or snap up this gorgeous workspace as your permanent headquarters. Catering perfectly to creative practitioners and small businesses including architects, photographers, film makers, illustrators, writers, agencies, interior and graphic designers and more, this unique office space is a beautiful new home for any Melbourne based business. This boutique workspace is located at 25 King Street, the former headquarters of the Melbourne Steamship Company. Freshly refurbished to the design of renowned Melbourne architects Kennedy Nolan, it retains many heritage features including the steamship company’s glass signage, original safe, grand staircase, solid timber flooring, fireplaces, tall ceilings and arch windows. Every aspect of the building’s renovations were selected in tribute to the building’s strong heritage – from the nautical colour palette to the privately commissioned art by Australian Benjamin Tankard who created a series of 9 paintings of the Melbourne Steamship Company’s ships, after which the suites and meeting rooms are named. The building is accessible and secured 24/7 with swipe card access and, thanks to a partnership with a neighbouring commercial parking firm, offers car parking and bike storage at a competitive rate. Located on King Street at the western end of Melbourne CBD, this office is within close reach of tram stops, Southern Cross Station, a wide range of restaurants and cafes, high end hotels, gyms and the Crown Casino complex. The advertised office space is perfect for a team of 8. If you need more or less space, we have over 30,000 furnished workspaces all over the world suitable for a team of 1 to 200+. Our award winning team offer a free service that will help you find the perfect solution for your needs, so reach out if you need more help. What you get for your weekly rent , 24/7 Access , 24/7 Security , Access to internal breakout areas , Access to kitchen facilities , Access to secure printer and scanner , Building outgoings included , Electricity usage included , Flexible terms , FREE use of the meeting rooms , One simple bill for everything related to your workspace , Regular cleaning , Secure high speed Internet Building features , Abundance of natural light , Air conditioning , Bicycle storage , Car parking in building (Paid) , Gym and fitness centre close by , Retail and shopping malls nearby , Taxi / Uber stand close to building 70m to tram stop at Melbourne Aquarium (35, 70 & 75) 400m to Southern Cross Station 250m to Virgin Active and food court on Collins Street 600m to the Crown Entertainment Complex Who is Office Hub? Office Hub is the world\'s No.1 marketplace for office space. We have a huge global selection of coworking spaces, serviced offices and shared office spaces with flexible options to suit teams from 1 200 people. We\'ll take you on a tour of all the workspaces that fit your needs and work on your behalf to get the best price possible. We\'ll help you discover how shared office space can be the most beneficial and budget friendly solution for your business. www.office hub.com Conditions apply – the advertised price includes any incentives offered based on a 12 month agreement and is available to new tenants only. Please note that the rental rate may increase for a shorter rental period. A portion of the square meterage factors in access to shared space. Cool Space | Prime Location | Enjoyable Working Environment $1266pw | 10 Person Works..
PROPERTY OVERVIEW $1266pw Price incl. Light, fresh and quiet coworking centre in Melbourne CBD. With bigger desks, beautiful natural light and more plants than a nursery, this architecturally designed coworking space is something a little special. It fosters collaboration, togetherness and support among like minded people without the commotion and clamour you find in some shared offices. Its serene and professional atmosphere sees it mostly attract established businesses, freelancers, designers, film makers, architectects, consultants and developers. Part of the office is a 100m2 private space available for rent now with its own meeting room, printers, a kitchen, bathrooms and a door that opens onto New York style exterior stairs, ideal for a team of 8 10 people seeking privacy at a lower cost. There are also coworking desks for rent at more than twice the size you’ll find elsewhere (yet still more affordable), with business grade internet and free use of a spacious meeting room with a presentation screen, A3 laser printers, a kitchenette, lockers and breakout areas. Each desk has its own set of drawers as well as an extendable private screen so you can stay in your zone when you need to. There are great deals available if you rent 4+ desks and the 100m2 private office space is a rare and amazingly priced option for any small business. Flexi terms for short and long term rent available now – come and work with a bunch of smart and inspiring people at this stunning Bourke Street coworking space! This Melbourne CBD coworking space is located at 388 Bourke Street in a character building listed as architecturally significant. Constructed in the late 1920s for a publishing company, the eight storey building showcases Commercial Palazzo style, finely worked exterior detailing and immaculate interior renovations and maintenance over the years. The building is shared with online juggernaut Etsy and a gorgeous rooftop events company, with whom this coworking company has a partnership – if you are looking to hold occasional workshops or events on an ad hoc basis you will have immediate access to the perfect setting. This shared office space is only moments from Hardware Lane, Bourke Street retail mall and tram services on Bourke and Elizabeth Streets. The advertised office space is perfect for a team of 10. If you need more or less space, we have over 30,000 furnished workspaces all over the world suitable for a team of 1 to 200+. Our award winning team offer a free service that will help you find the perfect solution for your needs, so reach out if you need more help. What you get for your weekly rent , 24/7 Access , 24/7 Security , Access to internal breakout areas , Access to kitchen facilities , Access to secure printer and scanner , Building outgoings included , Commercial grade internet (Free) , Electricity usage included , Flexible terms , Plug and play furnished workspace , Regular cleaning Building features , Abundance of natural light , Air conditioning , Bicycle storage , Car parking Street (Free) , Company branding in foyer , Disabled access and facilities , Taxi / Uber stand close to building Secure car park next door Less than 100m to 19, 57, 59, 86 & 96 51m to Hardware Lane 120m to Bourke Street Mall 800m to Flagstaff Railway Station Who is Office Hub? Office Hub is the world\'s No.1 marketplace for office space. We have a huge global selection of coworking spaces, serviced offices and shared office spaces with flexible options to suit teams from 1 200 people. We\'ll take you on a tour of all the workspaces that fit your needs and work on your behalf to get the best price possible. We\'ll help you discover how shared office space can be the most beneficial and budget friendly solution for your business. www.office hub.com Conditions apply – the advertised price includes any incentives offered based on a 12 month agreement and is available to new tenants only. Please note that the rental rate may increase for a shorter rental period. A portion of the square meterage factors in access to shared space. Creative Space | Trendy Location | Great Amenities $7077pw | 45 Person Works..
PROPERTY OVERVIEW $7077pw Price incl. OPENING 1 APRIL 2019! Vibrant coworking spaces in Docklands with art filled interiors, comfy lounges and networking events to help the creative community grow and thrive. Occupying six floors of this 22 storey tower, this coworking hub provides the space, community and convenience your team needs. Collaborate in a cosy corner, create in your private office and connect with like minds at the next event – this workspace is devised to hone businesses and their people. Onsite staff support you throughout the work week, free refreshments keep you energised and professional meeting rooms offer an environment for every appointment. Simple monthly billing takes the hassle of office space away, and inclusive internet and ready to use furniture make this workspace move in ready. Close to shops, restaurants and Marvel Stadium, you’ll find plenty of reason to step away from your desk and explore the exciting Docklands precinct. Enquire or schedule a visit today to explore options for individuals, small groups and teams with up to 100 people in this invigorating serviced office in Melbourne. Photos are example photos. 120 Spencer Street is positioned on the doorstep of Southern Cross Station for unparalleled accessibility in Melbourne’s emerging commercial district of Docklands. The 22 storey B Grade building boasts uninterrupted panoramic views, new destination controlled lifts, secure bike storage and modern shower and changing facilities to provide ultimate comfort for your team. Commuting is a breeze with easy proximity to trams, trains and buses, while after work fun awaits in the energetic Docklands precinct where great waterfront restaurants, energetic bars and entertainment venues converge. This Docklands office space puts you in the heart of the action surrounded by global leaders and emerging businesses in every field – join the hype and book a tour at this world leading coworking hub today. The advertised office space is perfect for a team of 45. If you need more or less space, we have over 30,000 furnished workspaces all over the world suitable for a team of 1 to 200+. Our award winning team offer a free service that will help you find the perfect solution for your needs, so reach out if you need more help. What you get for your weekly rent , 24/7 Access , Access to kitchen facilities , Building outgoings included , Collaborative space with a great community feel , Electricity usage included , Flexible lease with the ability to grow into bigger space , Fully equipped boardrooms, meeting rooms and day offices (fees may apply) , One simple bill for everything related to your workspace , Regular cleaning , Secure high speed Internet Building features , Abundance of natural light , Air conditioning , Bicycle storage , Creative co working space , Retail and shopping malls nearby , Professional environment , Bike racks , Impressive new fit out , Showers 53m to Southern Cross Train Station 140m to Collins Street trams (11, 12, 48, 109) 240m to Fitness First & Virgin Active 1km to Docklands' waterfront bars and restaurants 550m to Marvel Stadium Who is Office Hub? Office Hub is the world\'s No.1 marketplace for office space. We have a huge global selection of coworking spaces, serviced offices and shared office spaces with flexible options to suit teams from 1 200 people. We\'ll take you on a tour of all the workspaces that fit your needs and work on your behalf to get the best price possible. We\'ll help you discover how shared office space can be the most beneficial and budget friendly solution for your business. www.office hub.com Conditions apply – the advertised price includes any incentives offered based on a 12 month agreement and is available to new tenants only. Please note that the rental rate may increase for a shorter rental period. A portion of the square meterage factors in access to shared space. Innovative Working Environment | Vibrant Precinct | Stunning Finishes $7192pw | 25 Person Works..
PROPERTY OVERVIEW $7192pw Price incl. Beautiful workspaces for rent on Collins Street within a global network of luxury coworking spaces. For creatives, professionals and businesses seeking something a little different, here is a stunningly special workspace solution in Melbourne CBD. You’ll find spaces to match your mood, services to ease your journey and conversations to spark creativity. Split across two levels of the iconic Royal Bank Chambers, the coworking hub offers both open and private spaces that are clearly curated to provide high energy or ambient peace. The diverse facilities at this office space include indoor and outdoor function areas for up to 100 guests and you can take your pick from seven readily available meeting rooms, each designed for a specific purpose such as training days, board functions and idea generation. The concierge is on hand to help your day flow, whether you need a killer caffeine hit or someone to set up the video conferencing, and the community is carefully curated to bring together a diverse network of ambitious pros. This premier coworking space perfectly captures a refined European aesthetic and gives members access to partner workspaces in global capital cities – come and thrive in an exciting ecosystem of innovators, creators and go getters. Flexi memberships for 1 100 people starting from 1 month available now. This luxurious coworking space is set in the heart of the highly regarded Collins Street in the Royal Bank Chambers building, a true architectural icon in the heart of Melbourne CBD. Located at 287 Collins Street, it was built for ES&A Bank in 1941 and features stunning Art Deco finishes such as a white marble clad foyer and grand staircase along with modern end of trip facilities, retail and disabled facilities. The building is located in the middle of Collins Street to provide employees with unparalleled access to Melbourne’s vibrant laneways, high end retail and fantastic dining scene while decision makers will love the close access to CBD based clients. The advertised office space is perfect for a team of 25. If you need more or less space, we have over 30,000 furnished workspaces all over the world suitable for a team of 1 to 200+. Our award winning team offer a free service that will help you find the perfect solution for your needs, so reach out if you need more help. What you get for your weekly rent , 24/7 Access , Access to internal breakout areas , Access to kitchen facilities , Access to secure printer and scanner , Building outgoings included , Electricity usage included , Flexible terms , One simple bill for everything related to your workspace , Regular cleaning , Secure high speed Internet Building features , Abundance of natural light , Air conditioning , Bicycle storage , Car parking Street / Public Car Park (Paid) , Disabled access and facilities , End of trip facilities e.g showers, bike racks , Onsite Cafe / Restaurant , Taxi / Uber stand close to building 81m to Elizabeth Street Tram Stop 5 350m to Flinders Street Railway Station 270m to Bourke Street Mall 35m to Block Arcade 750m to Yarra River Who is Office Hub? Office Hub is the world\'s No.1 marketplace for office space. We have a huge global selection of coworking spaces, serviced offices and shared office spaces with flexible options to suit teams from 1 200 people. We\'ll take you on a tour of all the workspaces that fit your needs and work on your behalf to get the best price possible. We\'ll help you discover how shared office space can be the most beneficial and budget friendly solution for your business. www.office hub.com Conditions apply – the advertised price includes any incentives offered based on a 12 month agreement and is available to new tenants only. Please note that the rental rate may increase for a shorter rental period. A portion of the square meterage factors in access to shared space. Cool Space | Modern Building | Creative Space $3245pw | 20 Person Works..
PROPERTY OVERVIEW $3245pw Price incl. Situated in Melbourne’s entertainment precinct, this coworking centre in the East End is the ideal home to grow your business. With three floors of sleek private offices, bright and airy lounges and beautifully designed meeting rooms, it creates a unique and collaborative work experience for every member. This workspace rental provides desk furniture, printers, high speed internet and soundproof phone booths as well as the flexibility to upsize and alter your space as you grow. Reenergize with free micro roasted coffee and fruit water, catch up with a colleague in the comfy lounge and perfect your pitch in the AV equipped meeting rooms. And become part of a greater ‘we’ with workshops, thought leader panels and cheese tasting, whether you’re boosting your team’s culture or connecting with other self starters. Short and long term rent available from 1 month to 2+ years – book a tour through Office Hub for the best rates at this premier Melbourne CBD coworking space. 222 Exhibition Street is an A Grade office tower situated in one of Melbourne’s liveliest locations in the East End theatre and entertainment district. Rising 29 levels tall with parking, retail and office spaces, it boasts stunning protected views across the city and a vibrant location surrounded by restaurants and bars. This luxurious coworking centre spans three floors of the glass walled building and features a sprawling seventh floor balcony where you can watch the city hum beneath you. The already impressive construction was refurbished in 2017 to cement its place among Melbourne’s landmark office towers, with focus on sustainable features and wellness among tenants. It boasts a 4.5 Star NABERS Energy Rating, modern end of trip facilities and proximity to the city’s parks, gardens, bicycle paths and gymnasiums as well as proximity to nightlife, laneways and retail offerings. 222 Exhibition Street provides an elegant arrival experience with a lobby cafe and expanded retail offering as well as a stunning tessellated facade for a powerful street presence. The advertised office space is perfect for a team of 20. If you need more or less space, we have over 30,000 furnished workspaces all over the world suitable for a team of 1 to 200+. Our award winning team offer a free service that will help you find the perfect solution for your needs, so reach out if you need more help. What you get for your weekly rent , 24/7 Access , Access to complimentary bar , Building outgoings included , Collaborative space with a great community feel , Electricity usage included , Flexible lease terms from 1 month , FREE business networking events , Fully equipped boardrooms, meeting rooms and day offices (fees may apply) , Plug and play furnished workspace , Regular cleaning , Secure high speed Internet Building features , Abundance of natural light , Air conditioning , Complimentary business Lounge , Concierge on ground floor , Conference facilities available , Creative co working space , Impressive A grade foyer and fit out , Rooftop Bar and break out space , End of Trip facilities , Impressive new fit out 300m to Parliament Railway Station 400m to Bourke Street trams 500m to Carlton Gardens Next door to Comedy Theatre 270m to Chinatown Who is Office Hub? Office Hub is the world\'s No.1 marketplace for office space. We have a huge global selection of coworking spaces, serviced offices and shared office spaces with flexible options to suit teams from 1 200 people. We\'ll take you on a tour of all the workspaces that fit your needs and work on your behalf to get the best price possible. We\'ll help you discover how shared office space can be the most beneficial and budget friendly solution for your business. www.office hub.com Conditions apply – the advertised price includes any incentives offered based on a 12 month agreement and is available to new tenants only. Please note that the rental rate may increase for a shorter rental period. A portion of the square meterage factors in access to shared space. Economical Workspace | Central Location | Professional Space $262pw | 4 Person Workspa..
PROPERTY OVERVIEW $262pw Price incl. Affordable shared office space for rent in Melbourne’s legal precinct. Offering 24/7 secured access and all inclusive boardroom use, this workspace represents a cost effective and flexible option in Melbourne CBD’s office market. On offer is a shared coworking space with up to six desks or a private office suite with up to four desks, each with full office furniture, high speed internet and lockable storage while cleaning and maintenance is taken care of for you. The office is lined by full height windows on one side benefitting from all day sun and the feel good factor of natural daylight. It is shared with a professional services firm that recommends the location and office space for lawyers, accountants and other professional services companies looking for a friendly yet quiet and productive working environment at a great price. Flexi terms available from 1 month until the end of 2019. Strategically located on the corner of Queen and Lonsdale Streets, this B Grade office building is perched above Melbourne Chambers in the centre of Melbourne’s legal precinct. The building benefits from triple street frontage on high traffic streets and the 11 floors enjoy natural light from three sides and excellent CBD views as well as ground floor retail so you can grab a coffee without leaving the building. When you do step outside, you’ll find a range of popular restaurants and gyms in the immediate vicinity, high street shopping at Bourke Street Mall and easy public transport links via buses, trams and trains at Flagstaff and Melbourne Central train stations. Also close at hand are the County Court of Victoria, Melbourne Children's Court, Melbourne Magistrates Court and the Federal Court of Australia. The advertised office space is perfect for a team of 4. If you need more or less space, we have over 30,000 furnished workspaces all over the world suitable for a team of 1 to 200+. Our award winning team offer a free service that will help you find the perfect solution for your needs, so reach out if you need more help. What you get for your weekly rent , 24/7 Access , 24/7 Security , Access to internal breakout areas , Access to kitchen facilities , Building outgoings included , Electricity usage included , Flexible terms , Lockable storage unit , One simple bill for everything related to your workspace , Plug and play furnished workspace , Regular cleaning , Secure high speed Internet Building features , Abundance of natural light , Air conditioning , Car parking Street / Public Car Park (Paid) , Disabled access and facilities , Gym and fitness centre close by , Retail and shopping malls nearby , Taxi / Uber stand close to building 600m to Melbourne Central 10 min walk to the iconic Queen Victoria Market 900m to Coles on Spencer Street Who is Office Hub? Office Hub is the world\'s No.1 marketplace for office space. We have a huge global selection of coworking spaces, serviced offices and shared office spaces with flexible options to suit teams from 1 200 people. We\'ll take you on a tour of all the workspaces that fit your needs and work on your behalf to get the best price possible. We\'ll help you discover how shared office space can be the most beneficial and budget friendly solution for your business. www.office hub.com Conditions apply – the advertised price includes any incentives offered based on a 12 month agreement and is available to new tenants only. Please note that the rental rate may increase for a shorter rental period. A portion of the square meterage factors in access to shared space. Excellent Lighting | Enjoyable Working Environment | Premium Facilities $2965pw | 10 Person Works..
PROPERTY OVERVIEW $2965pw Price incl. A premium serviced office in a glamourous Melbourne location – this office gives a highly professional image for you and your business in the city’s best business location, with corporate styling, first rate reception services and all vital amenities including fast fibre, phone, electricity, kitchen, regular cleaning & 24/7 access. Welcome clients into an impressive setting and allow your productivity to flourish and your bottom line to grow! This prestigious address on Collins Street is arguably Melbourne’s most sought after and influential business location. A true Melbourne landmark, the premium A grade office building towers majestically and surveys the city from above the “Paris end” of Collins Street. 101 Collins St is home to some of the city’s most high profile businesses and tenants enjoy world class facilities including a spectacular entry foyer, secure bike storage, showers & changing rooms, a basement car park with spaces for lease and onsite concierge. The advertised office space is perfect for a team of 10. If you need more or less space, we have over 30,000 furnished workspaces all over the world suitable for a team of 1 to 200+. Our award winning team offer a free service that will help you find the perfect solution for your needs, so reach out if you need more help. What you get for your weekly rent Furnished office with desks, chairs and lock up storage units Commercial grade internet service Telephone line and personalised phone answering Use of kitchen facilities with premium coffee/tea service Electricity usage included Complimentary receptionist to meet and greet your clients Prestigious business address Flexible terms from 1 month to long term Ability to bring your existing phone number over Business lounge with complimentary break out areas 24 x 7 Access to your office 24 x 7 security Office features Immaculate fit out and facilities Full mail management and postage Large boardroom and meeting rooms Signage board in foyer to highlight your business name Professional environment Server / Comms rooms available for server storage Building features Modern high rise classified as an "A" grade building 24 x 7 access to your office High speed lifts Car parking in building and surrounding areas Dedicated on site management team The advertised price includes building outgoings and is based on one person occupying the workspace. If you have 2 or more people extra fees will apply to cover off services like telephone, internet and kitchen amenities. 5m to Collins Street Trams 50m to Collins St Buses 300m to Parliament Train Station 4 minute walk to Eau De Vie Melbourne 200m to Treasury Gardens Park WHO IS OFFICE HUB? Office Hub is Australia & New Zealand\'s No 1 small office space commercial real estate agency. We have the largest collection of shared spaces, coworking and serviced offices in Australia & New Zealand, perfect for 1 100 employees. Let us take you on a tour of all the spaces that fit your needs and budget. Our service is complimentary and we work for you and the landlord to negotiate the most competitive deal in the market. Let us show you how shared and serviced offices can be the perfect solution for your business. www.office hub.com.au www.office hub.co.nz Conditions apply A portion of the square meterage factors in access to shared space. Price includes any incentives offered. This is for new tenants only. Spacious Working Environment | Coworking | Natural Light $1767pw | 16 Person Works..
PROPERTY OVERVIEW $1767pw Price incl. Stylish serviced office with creative flair in the heart of Melbourne. Price includes: Internet, Electricity & Kitchen Facilities Flexi Terms Large Windows 24/7 Access Dedicated Receptionist Perfect Melbourne CBD Location Recognised Building Newly refurbished Avail NOW for short or long term rent Located amongst some of the city's most notable addresses, this building offers offices on 11 levels right at the corner of Collins & William Streets. All levels features natural light and includes access to more than eight meeting rooms, a spectacular client lounge and on site concierge. Enjoy the convenience of a free tram stop at the front door, or a short stroll to the train station, the GPO, restaurants plus easy access to the freeway to the airport. The advertised office space is perfect for a team of 16. If you need more or less space, we have over 30,000 furnished workspaces all over the world suitable for a team of 1 to 200+. Our award winning team offer a free service that will help you find the perfect solution for your needs, so reach out if you need more help. What you get for your weekly rent Furnished office with desks, chairs and storage units Unlimited commercial grade internet service Use of the kitchen facilities with premium coffee/tea provided Complimentary receptionist to meet and greet your clients Telephone number & handset Ability to bring your existing phone number over Dedicated telephone answering Regular cleaning of your office IT & administrative support Access to fully equipped meeting rooms and boardrooms Prestigious business address to put on your cards Flexible terms from 1 month 2 years 24 x 7 access to your office 24 x 7 security Office features Stunning views from select offices Up to 8 boardrooms and meeting rooms Individual controlled air conditioning in all offices Fully furnished Quality & modern furniture Building features Modern building Lift access Affordable parking in surrounding areas Dedicated on site management team 50m to Collins Street trams 150m to The Yarra River 700m to Southern Cross Train Station Close to cafes, restaurants, pubs & shops in fact everything! WHO IS OFFICE HUB? Office Hub is Australia & New Zealands No 1 small office space commercial real estate agency. We have the largest collection of shared spaces, coworking and serviced offices in Australia & New Zealand, perfect for 1 200 employees. Let us take you on a tour of all the spaces that fit your needs and budget. Our service is complimentary and we work for you and the landlord to negotiate the most competitive deal in the market. Let us show you how shared and serviced offices can be the perfect solution for your business. www.office hub.com.au www.office hub.co.nz Conditions apply A portion of the square meterage factors in access to shared space. The advertised price includes any incentives offered based on a 12 month agreement. If a shorter period is agreed to please note the price may increase accordingly. This is for new tenants only. Innovative Working Environment | Impressive Location | Buzzy Workspace $1253pw | 9 Person Worksp..
PROPERTY OVERVIEW $1253pw Price incl. A coworking office with added “wow” factor! Natural light pours in through large windows to throw contrast on the many original features and create an inspiring working environment with a comforting feel of days gone by. The dynamic combo of private offices, coworking desks and conference space draws businesses from limitless industries to create a thriving community based on success and sociability. 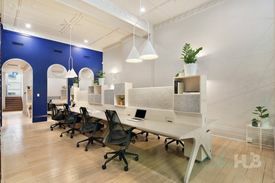 This classy coworking hub is in the historical London Stores – a large and handsome heritage building completed in 1922 and ideally located on the prominent corner of Elizabeth Street and Bourke Street. Getting here is a breeze – there are plenty of tram and bus stops nearby and it’s only a short walk to Flinders Street Station. Bourke Street Mall and Federation Square offer great shopping and after work options for an evening on the town enjoying local entertainment or a few cocktails. The advertised office space is perfect for a team of 9. If you need more or less space, we have over 30,000 furnished workspaces all over the world suitable for a team of 1 to 200+. Our award winning team offer a free service that will help you find the perfect solution for your needs, so reach out if you need more help. What you get for your weekly rent , Access to internal breakout areas , Premium Coffee/Tea Facilities , A prestigious address to put on your business cards , Flexible lease terms from 1 month , One simple bill for everything related to your workspace , FREE business networking events Building features , Cafe/restaurant onsite , Modern fit out , Showers , Collaborative and engaging work environment 550m to Flinders Street Station 170m to Bourke Street Mall and Federation Square Short walk to mecca for food, pubs and retail WHO IS OFFICE HUB? Office Hub is Australia & New Zealands No 1 small office space commercial real estate agency. We have the largest collection of shared spaces, coworking and serviced offices in Australia & New Zealand, perfect for 1 200 employees. Let us take you on a tour of all the spaces that fit your needs and budget. Our service is complimentary and we work for you and the landlord to negotiate the most competitive deal in the market. Let us show you how shared and serviced offices can be the perfect solution for your business. www.office hub.com.au www.office hub.co.nz Conditions apply A portion of the square meterage factors in access to shared space. The advertised price includes any incentives offered based on a 12 month agreement. If a shorter period is agreed to please note the price may increase accordingly. This is for new tenants only.